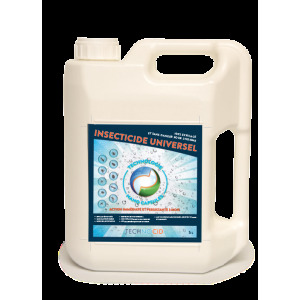 Insecticide professional technocid 5 liters has a new encapsulation technology assets for more effective enforcement against arachnids and insects, more sustainable and healthy for humans and the environment. Insecticide professional Technocid acts against 5 liters arachnids and insects flying, crawling and dormant. Such as flies, ants, mites, cockroaches, beetles, mites, ticks, mosquitoes, fleas, bed bugs and other insects. TECHNOCID be used inside or outside surfaces, materials, textiles, furniture and equipment. Also applies to bedding to fight effectively against mites. Destroys dust mites and bed bugs in less than 30 minutes.